The other awning an RV’er might be familiar with is the power awning.This awning is one of the most user-friendly awnings. Some even have wind sensors or rain shocks. Power awnings are very similar to manual awnings with the exception of the way they work. Unlike manual awnings power awnings have different hardware that is operated with a 12 Volt switch inside the unit. This allows for easier set up and take down of the awning. 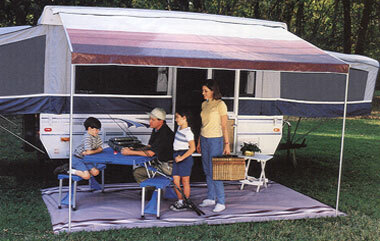 Bag or case awnings are very popular on smaller and soft-sided RV’s (tent-trailers or hybrid type units). Bag awnings slide into a permanently mounted awning rail and are put out using tent-like poles. Unlike other awnings the hardware (poles) have to be stored as they are not mounted on the unit. The poles are usually adjustable and have some sort of tension rafters. Bag awnings are measured from end of bag to end of bag and only come in lengths between seven and twelve feet. sun, dirt, debris, and water from direct contact with your slide roof and seals. Slide awnings come in black, white or satin and come in sizes to cover slides from 56” to 192″. Slide out awnings are very beneficial to protecting the longevity of your slide out. Window awnings are very similar to slide out awnings with the exception that they come in a variety of colors, smaller lengths, and are manually extended. Window awnings are usually seen on higher end units such as class A motor-homes. 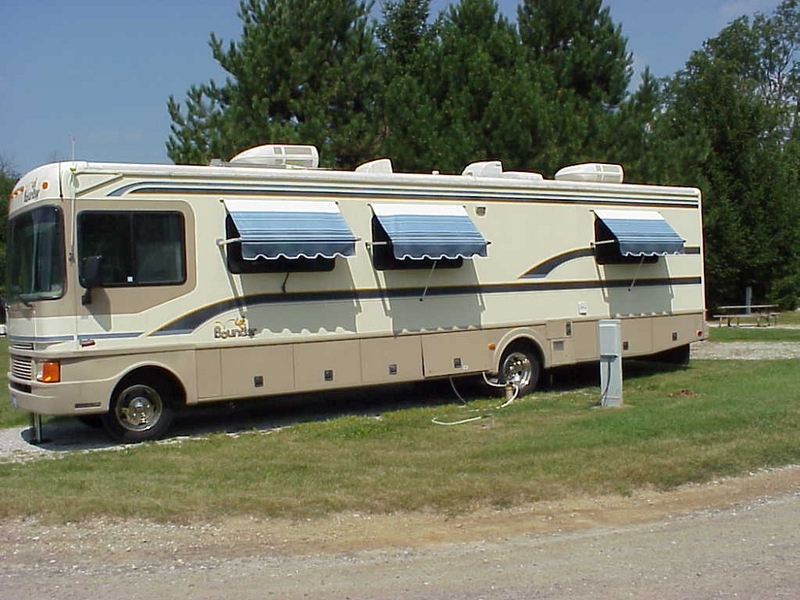 If your recreational vehicle did not previously come equipped with an awning most units can have an awning installed on them. All that you need to do is talk to someone at your local RV service center and get them to measure your unit and check for awning provisions. 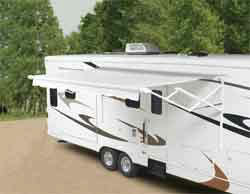 Now that your are familiar with the types of RV awnings how do we take care of them? Because awnings are made of tensioned fabric they are naturally affected by the weather that we want to use them in the most – the sun, rain and wind. The sun like everything else, will gradually deteriorate your awning until it is weak and no longer waterproof. UV treatment will help to keep your awning looking like new longer. It is okay to leave your awning out in the rain as long as you slant the fabric so water doesn’t pool and never leave it stored while damp (allow to air dry). 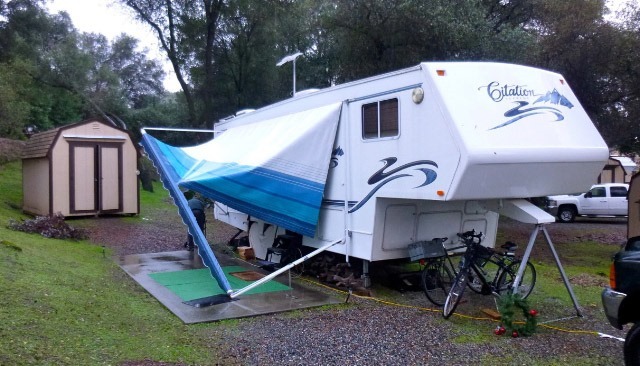 The weather that you don’t want to expose your awning to is wind. A fast wind can not only rip the awning fabric, but it can damage the entire awning, side of the unit, and even roof. In order to avoid “weathering” your awning in the sun, wind and rain, use awning tie downs and awning UV restoring awning cleaner at least once a year. 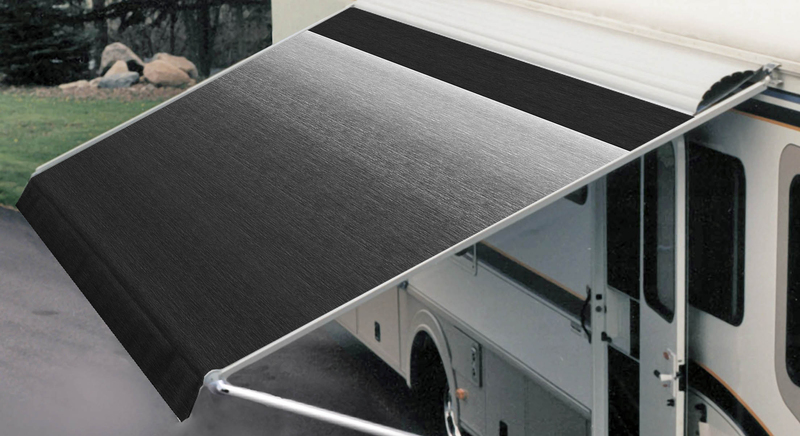 If you do have awning troubles we have a few helpful solutions. 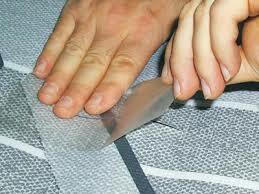 Not all rips in awning fabric mean that the fabric needs to be replaced. Often a roll of RV awning tape will do the trick! Most hardware pieces are easily replaceable as is the fabric, and we are able to repair or replace it for you! There are many add-ons to make your awning even better! There is everything from clamps that control or stabilize your awning from flapping in the wind to lights that slide right into the roller tube. Some even make their awning into a room outside of their RV with an extension that slides right into the awning components called an add-a-room. Awnings can be easy and enjoyable to use; however they also can be quite dangerous if not cared for and repaired properly. Most add-ons and tapes can be installed by the user; although only trained professionals should replace the awning hardware, fabric, or roller tubes. These mechanisms are all tension based and can do extreme harm to the individual or the unit they are working on if not properly trained.